ISSN 1550-3410. (Single User License) 63-page document. This report contains the results from the most comprehensive study undertaken in the period of 2001-2003 to evaluate the status and prospects of the e-health in Japan, and trends on healthcare related Internet issues based on a 4P component view of the Japan market – Pharma, Provider, Patient and Payer. Included are 24 charts, 3 figures and 4 tables. 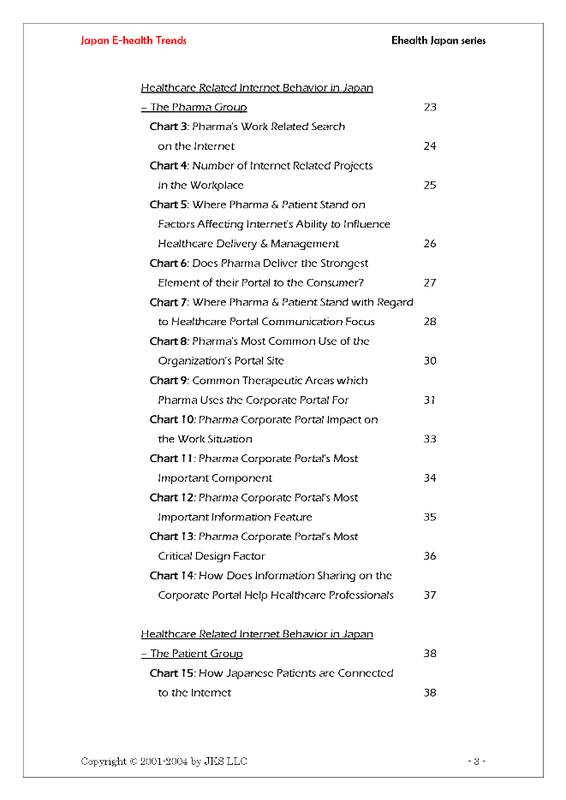 The full Table of Contents is available at http://www.ehealth-japan.com/downloads/Japan E-health Trends_ToC.pdf. Japan e-Health Trends: Japan e-Health Trends segments the Japanese e-health market into four key component areas ? Pharma (pharmaceutical industry), Patient, Provider (practicing clinicians) and Payer (health insurance providers), i.e. the 4Ps of e-Health. The focus of the study, based on a combination of online survey and face-to-face interviewing methodologies, has been on Pharma, Patient and Provider areas where the change management issues have been most critical. The report evaluates the various e-health growth and barrier segments in view of current trends and healthcare professional/physician/consumer attitudes. Research Capability: * Presents key findings from a pool of 578 recipients employed in Japanese pharmaceutical industry * Face-to-face Patient questionnaire sampling yielded a 100% response rate for the 46 recipients * Provider questionnaires were conducted on a sample of 36 HP personnel employed in a local Japanese hospital with all participants responding to the questionnaire face-to-face * Visual display of 24 charts along with easy-to-understand tables and figures, clearly identifying the opportunity gaps and current trends of this fast growing industry. Analysis Highlights: Physician repository grid analysis investigated opinions relating to e-Health topics such as online conferences, continuing medical education, practice websites, online payments and other related issues in the clinical workplace. With their hectic working patterns Japanese doctors have a low Internet technology affinity amongst the 4P e-health groups while the Pharma group has a greater level of activity and risk taking in terms of e-health improvisation. The Patient group was more convinced of the doctor being the communication focus for the healthcare portal than Pharma upholding this view. However Patients were markedly 7.3 times more likely to use the Internet for a health related information search as opposed to undergoing a physician consultation online. A clear driver in healthcare development for Pharma end users is implementation of a suitable Internet platform that will provide an organized information function on their corporate portal. Also added value would come from an updated information facility with a focus in the regulatory area if included in this delivery suite. Practical Use to the Reader: * Understand the current and prospective Japanese e-Health market and identify business development opportunities and risks * Healthcare marketing specialists can evaluate (or reevaluate) their Japan strategy through new e-Health findings by knowing and addressing the online requirements for healthcare professional/physician/consumer requirements * Augment your organization’s online presence in the Japanese market by investing in success critical Internet-based services relevant to the current market. Copyright © JKS LLC 2004.